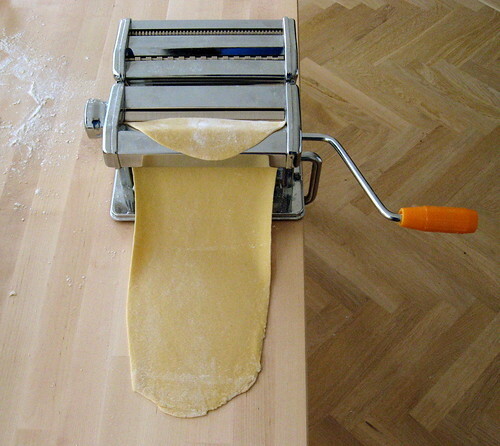 Making fresh pasta is actually remarkably easy if you have a pasta roller. It really only takes me about 20 minutes from start to finish and some of that is time to let the dough rest. (A word to the wise: The first time I remember it taking us something like an hour, so don't despair it if takes you some time to get the hang of the rolling and flouring process.) 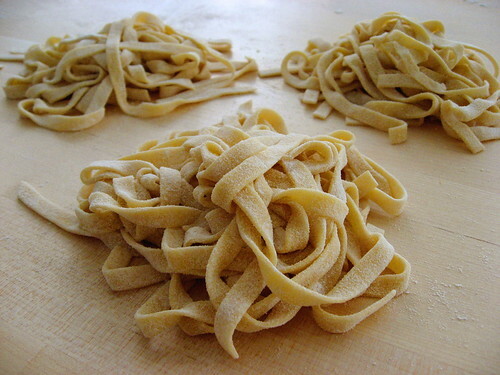 If you've never had fresh, homemade pasta, it's completely different from dried or store-bought fresh pasta. The texture is much more delicate. 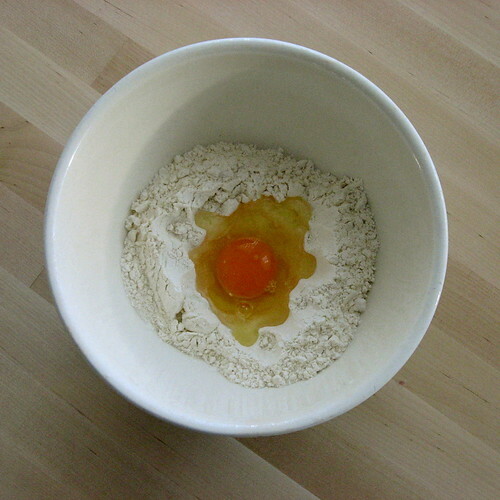 In a large bowl, make a well in the flour, crack in the eggs, and beat eggs with fork, slowly working in the flour from around the edges. 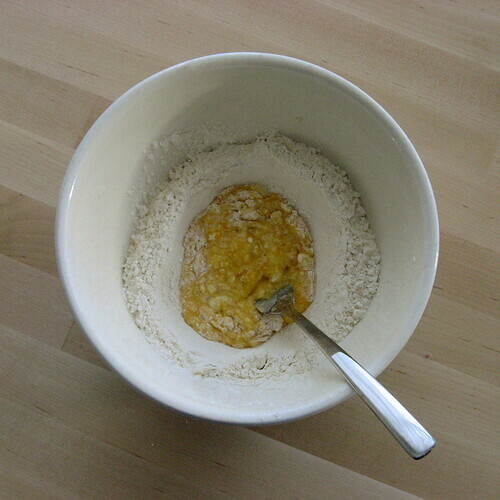 When it forms a dough, knead a bit more flour in on the counter until it's not so sticky. You'll definitely have leftover flour that didn't work into the dough, but that will get used in the next step. 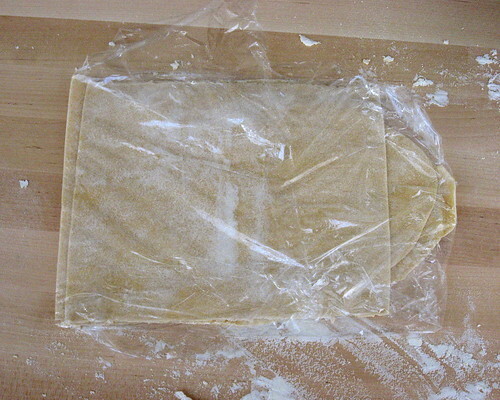 If this is your first time making pasta, you might want to leave the dough to rest for 20 minutes (covered), and it will be easier to roll out. I never bother with this resting period anymore. Press your dough into a flat shape and pat with flour on both sides until it's not sticky. 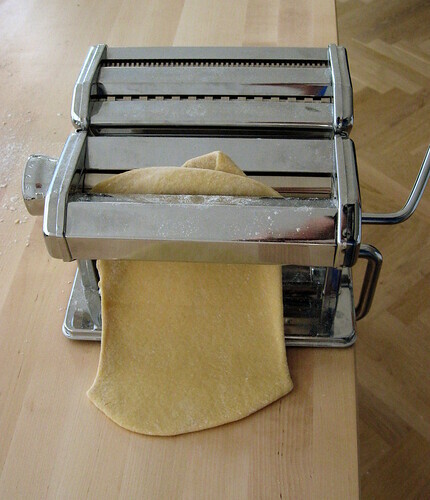 Set up your pasta roller and, starting on the widest setting, roll your pasta through. (You might end up with it being sticky and tearing if you didn't let it rest or didn't flour it enough. Don't worry, it will come together). Flour it, fold it in half, and repeat until it no longer gets sticky. This stage is basically just kneading in more flour. Eventually, it will start to feel smooth and a bit leathery. Now you can start rolling it thinner. Go to the next setting, roll it through and lightly flour it if there's any trace of stickiness. Keep repeating this until you're down to the next to last or last setting. For angel hair, you need to go to the thinnest setting, but everything else is fine on the next-to-last setting. 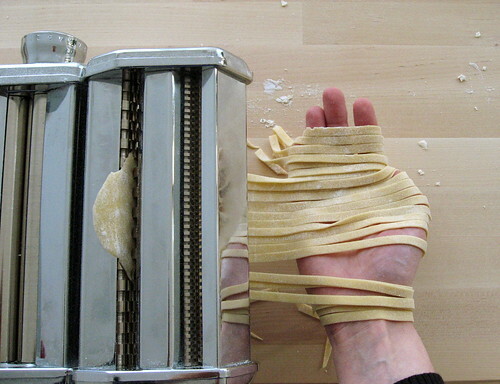 Cut your sheet of pasta into the lengths you want your noodles. At this point, you should leave your dough to rest for at least 10-15 minutes. 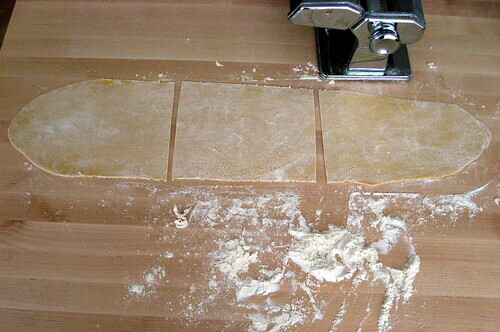 If you try to cut it now it will be too sticky and gum up the cutter and the noodles will stick to themselves. Make sure to flour it well if you stack the pasta sheets. 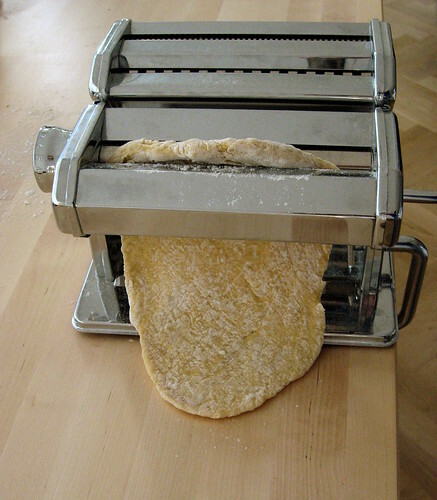 When your dough is ready, run it through the cutter (or cut by hand). Catch the noodles on your hand as they come out... this is a lot easier if you're not trying to take a picture of it while you do it! 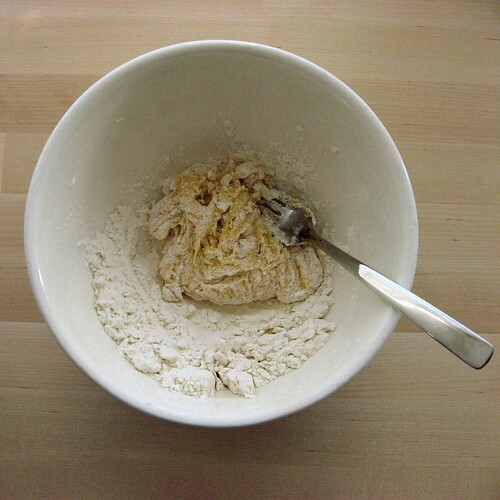 Toss each batch of noodles with flour to prevent sticking. If you're not cooking your noodles immediately, mound them loosely and cover with cling film so they don't dry out. When you're ready to cook your pasta, drop it into salted boiling water for just a few minutes. These noodles took 4 minutes to cook. 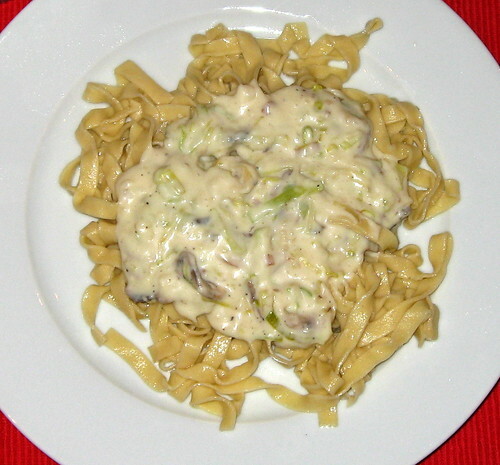 We served them with a mushroom-leek cream sauce. Thanks for posting such great step-by-step pictures with the instructions. I got so fed up last time with stickiness, that i haven't made pasta in nearly a year! Can you recommend what to use if you want to avoid plastic wrap? Would a damp tea towel work okay? 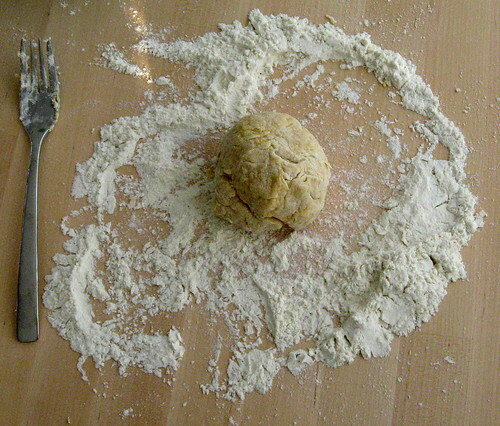 @SusanM The more flour you work into the dough when you knead it, the easier the rolling will be. Unlike bread, you really don't need to worry that you're adding too much flour! I would be worried that a damp tea towel would make it sticky, so I'd try covering it with a dry one or inverting a glass baking dish over it. Oh wonderful! I've been eyeing the pasta rollers here wanting to get one but wasn't quite sure how to master the art of pasta making. Hopefully I can pick one up soon and test this out!